Madhugiri fort was in my list of places to trek since a long time. 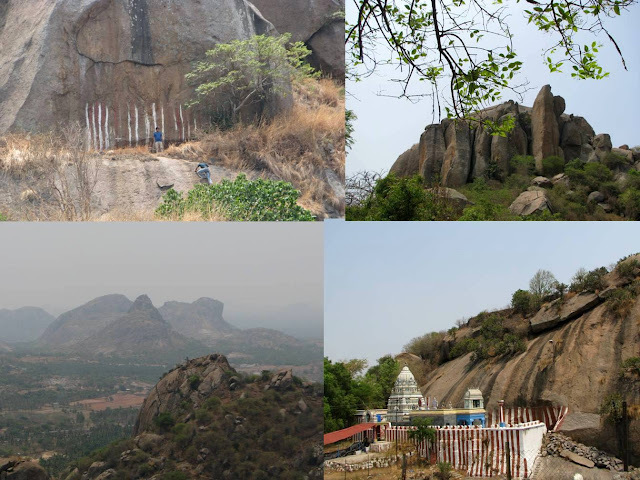 And last weekend (April 16th) I finally planned to cover the Madhugiri taluk. 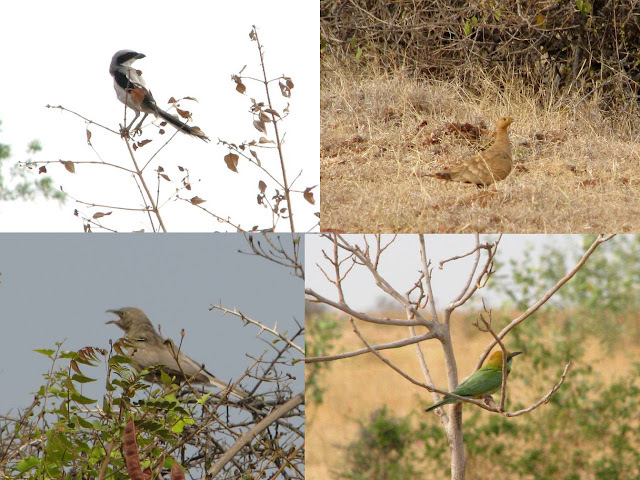 My research showed a fort hill, few temples and a blackbuck sanctuary that made this trip defined under more than just “A” tag. 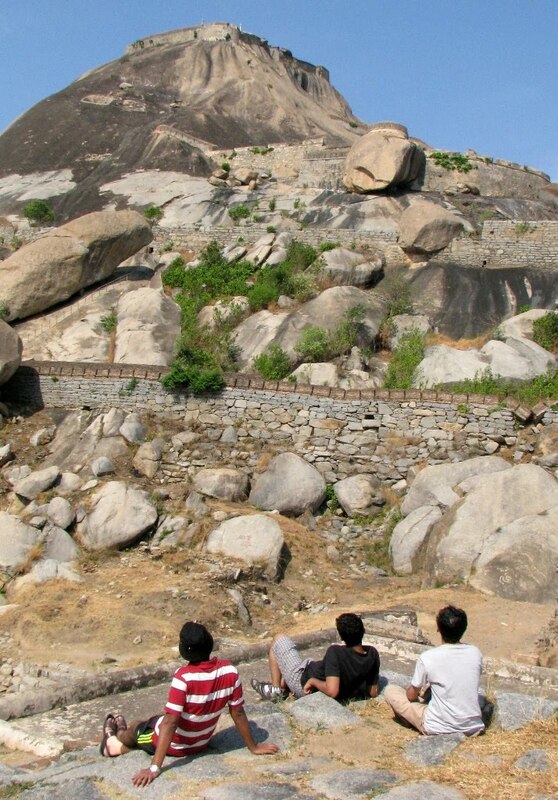 Friends S, M and I left home at around 6AM and reached Madhugiri at around 8:30AM. We stopped by a very quiet and serene place just before reaching the town, to have our packed breakfast. Beneath a banyan tree, overlooking a few hills, we boosted our energy with some food. As you enter the town, you can see the tall magnificent monolith – Asia’s tallest. You can drive inside the fort gates and park by the Kodandaram temple. The priest told us that there were few temples at the top but the idols have been reinstalled down as it was difficult to climb up. 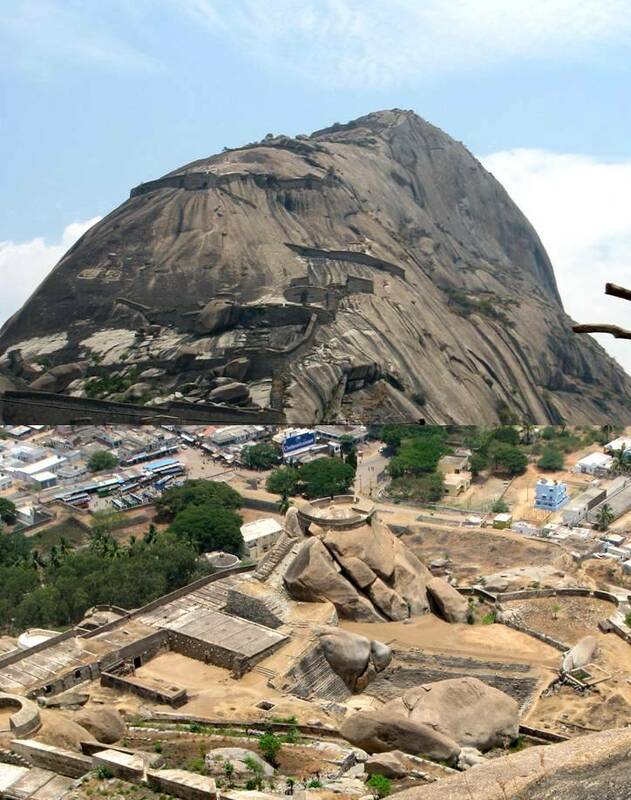 At 3930 feet elevation, Madhugiri is a single hill. It is the largest in Asia and second largest in the world. 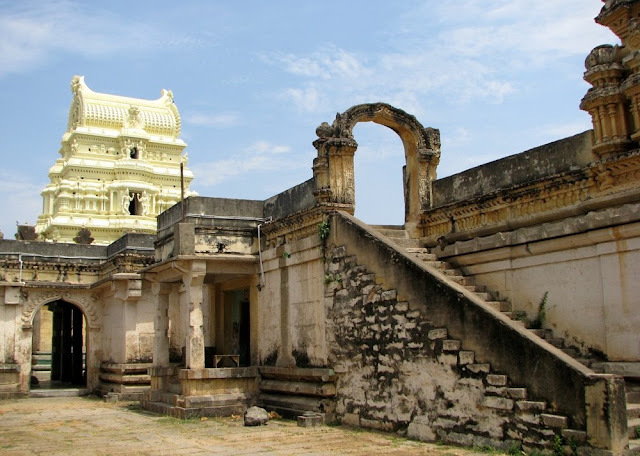 Nestled in its steep slopes is a fort built by vijayanagara dynasty. Antaralada Bagilu, Diddibagilu, and Mysore Gate are the three gateways of the fort. A series of doorways leads to the hillock. The ruined temple of Gopalakrishna is located at the top. The trek up, was excellent and very interesting with several false summits. 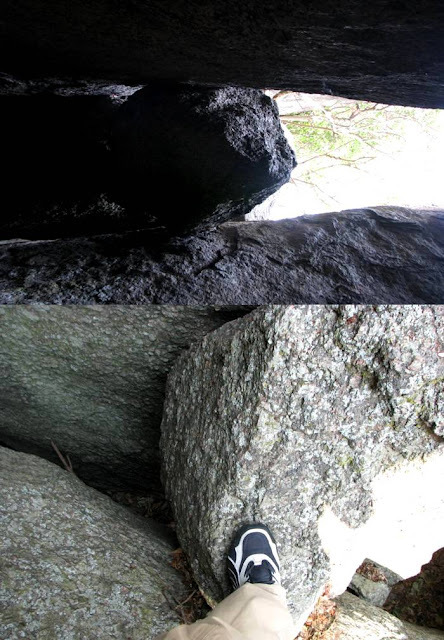 Initial flights of stairs disappear into plain rocks or some cutouts to climb but there are grills to hold on to. Several entrances within the fort lead to old structures and temples. There is a nice pushkarani type of pond inside. After about two hours we reached the summit where you can find a temple in ruins (with almost no hint left of a temple) and a nice long shelter by its side. I assume the soldiers rested here. We relaxed at the top for a while experiencing the cool breeze and a beautiful view of the town and surroundings. In the town are two old temples of Venkataramanaswami and Malleshwara built by the Vijayanagara feudatories in the Dravidian style. 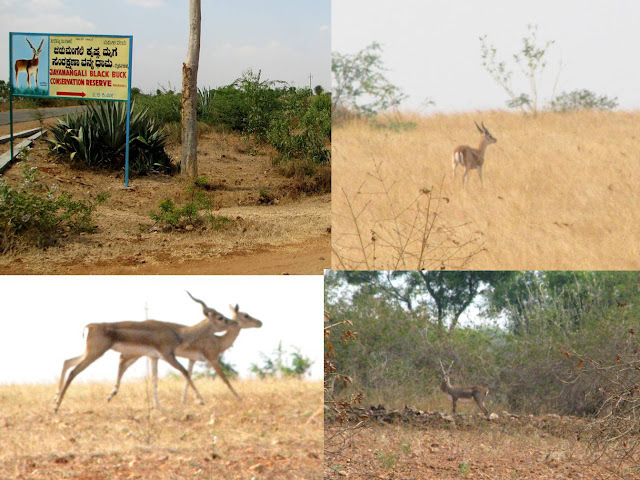 The sanctuary is a left deviation on Madhugiri-Pavagad road. There are good directions everywhere and hence one won’t find much difficulty getting here. The sanctuary is something i did not expect to see within 100kms from Bangalore. It was vast 100's of acres of land. We were lucky to spot some as soon as we entered. We took a drive on the mud road. The forest guard informed us that he could take us on a guided tour and there were guest house if one wanted to stay overnight. Most of the black bucks, he says are now migrating out of the sanctuary to the farms nearby and shall return during rain, which would be the best time to visit, he says. Some photographer had pictured several birds and animals in the sanctuary; impressive pictures of which hang on the guest room walls. We thanked the forest guard and left. We were lucky to spot some more blackbucks that seemed to keep an eye on us and run away as we moved any closer. Apart from them, several birds were more approachable for some good photograph. M had to leave to Chitradurga and he had to board a bus near Nelamangala at 6:30PM. With little time we had, I drove very fast. In the hurry no one noticed that we had taken the Tumkur route which actually turned out positive as we had more time now for him to board. We stopped at Pavithra hotel, Tumkur which is famous for Thate idly and awesome masala dosa. Just when we were about to leave, someone pointed at our flat tire. I recollected the warning from the shopkeeper. A little more than the speed at which they change tires in a F1 race, we three jumped at the process. As one set the caution board, one set the jack and other loosened the nuts. The tire was changed in no time and we quickly dumped everything back and drove to the toll booth were M had to board his bus. The last ten minutes of this trip was the most eventful of it all. It was a very nice and not a overly planned trip hence it was so very exciting with so many unexpected happenings that together form a trip. I realize that we should allow events to form together and create a trip and not plan every single moment of it. It is these unexpected's that build a great memory. 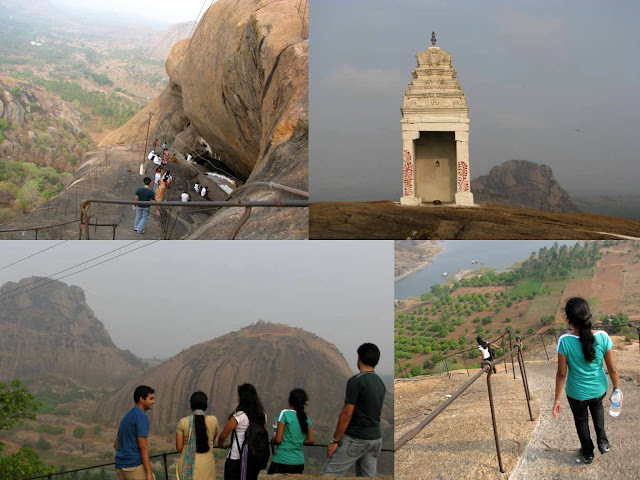 My wife P and I were joined by my cousins and their friends for a trek to two hills in Ramanagara on the 2nd of April. We left home at 6:00 AM and reached Revannasiddeshwara Betta base by around 7:00 AM and started climbing the hill immediately. While driving from Bangalore, the road to the hill turns left from Ramanagara just past the Mini Vidhanasaoudha. The trek is pretty easy and seemed a very short one to all of us. Of course I was here once before in 2009 and new the place well. We reached the top by 8:00 AM were some other devotees waited for the priest to come and open the temple doors. The monkeys bothered the visitors by dragging away their foods; hence we decided to have our breakfast somewhere at the base. We walked down; drove a nice place by a lake filled with lily and had our packed food. A care taker of a nearby Mango groove traded few raw mangoes for some pickle that he would later, I believe will relish along with the alcohol. We drove to Ramadevarabetta, near the town (When driving from Mysore its a left turn just after the town...From Bangalore, an arch can be seen on right just after Gausiya college). It’s a nice ride till the gate and around 500 steps lead you up the hill. On the way we spotted this cool place exactly similar to the 127 Hours type and we tried some experiments like Aron Ralston. After the flight of steps you reach an open area with two temples (Rama and Shiva) and a lake surrounded by more rocks. We climbed the one on the right as it had well defined trail. It had some steep elevations at the summit. The view from the top as usual was mesmerizing. I was thrilled with the thought of climbing the rock on the left, as it did not seem to have a well defined path up the summit. My cousin N and I began this adventure as the ladies rested at the open area. We found a trial that ended some distance gone and then, we experimented with the route to get to top which was very exciting. The rocks lay there one hugging other, one overlapping the other and the place reminded me of the adventures of Aron Ralston more than ever. We found a trial to return and followed it to the temple. Our next stop was good lunch at Kamath. Karavali Otta was a treat with several Mangalore dishes like Pathrodey and sheme begin served. Next to the hotel is a cultural museum with some artifacts from centuries before. 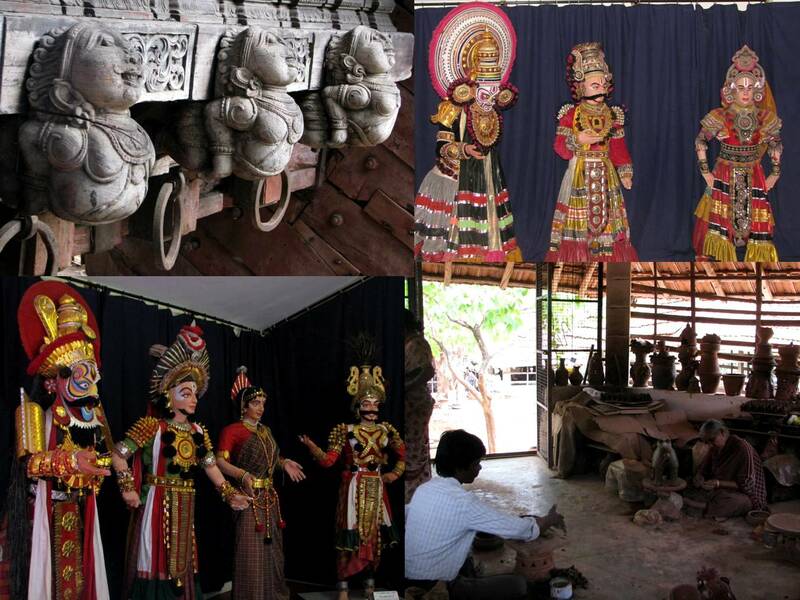 It also has good collection of photos and models depicting different art forms around our state. A folk video was being shot here. It was a mix of emotions there. The villagers who had come to perform were innocent and some like many artists, overly sentimental. A organizers with sugar coated words took advantage of their sentiments, a director corrected their positions and body language. 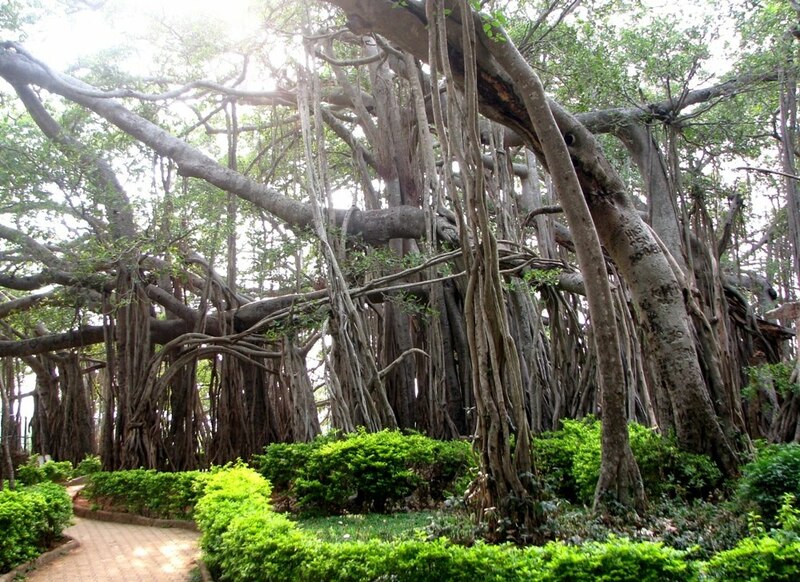 We next drove to Doddalada mara, which is a huge banyan tree spread across a vast land now converted into a park. We had one stroll around there and having nothing much to see, we drove to Manchebelle dam. The dam is closed to visitors but we hoped to drive by the backwaters to watch the sunset but unfortunately on that day and on national holidays even the road to backwaters is closed. Two police constables stood there to stop people. Seeing an hour more to sunset, we returned back home. It was a great day and I was happy to have covered a lot of places around Bangalore. On 5th of April 2011, 71 year old Anna Hazare started a 'fast unto death' to exert pressure on the Government of India to enact a strong anti-corruption act as envisaged in the Jan Lokpal Bill, a law that will establish a Lokpal (ombudsman) that will have the power to deal with corruption in public offices. People across India supported this movement and Bangalore was no behind. Four citizens went on indefinite fast in front of Freedom Park. Few of my office colleagues wanted to be part of this and so after work, we arrived at the location. Here we joined thousands of others who had arrived to support the movement. We filled forms that asked for our name and address; collected candles and stickers from other supporters and walked to the pathway to join the other supporters. The air filled with several slogans such as – “Bekke Beku Lokpal beku” (Lokpal is a must); “Gali Gali Mein shoor hein Sarey Neta choor hein.” (Voices in every street say, all the politicians are thieves) “ Vande Mataram” (Mother, I bow to thee! ), “Jai Bharath Matha Ki.” (Long live India) “Kodolla Kodolla Luncha Kodolla.”(No we won’t, no we won’t, Give bribe) and so on. There were people from ever genre and every age and we all lit the candles. I saw the frustration turn into revolution in many Indians who rather see their tax being spent on development of the nation and not the politicians. After few hours of slogans, we had talks from the citizens fasting who expressed their agitation towards Government and corruption. Some comments such as – “A king with power and no responsibility is dangerous. I am a common man without power but responsibility.” Were direct blows even without names being mentioned. Together the crowd sang the national anthem and “Hum honge Kamiyab….” This morning we woke up to good news that Government has agreed to the demands and Anna Hazare would break his fast. It was a great movement and I am glad I was able to be part of it. The initial aggressiveness of young software engineers, reminded me of the French student revolution or a German Baader-meinhof red army factions emerge but then I realized that we have been blessed by the principles of Mahatma, which teaches us non-violent ways of protest against injustice. I am glad we have this history and learning’s that hopefully would prevent us for a long time from taking fanatic approaches that usually does more bad than good.